This is the third part in a multi-part series, read the first part here and the second part here. 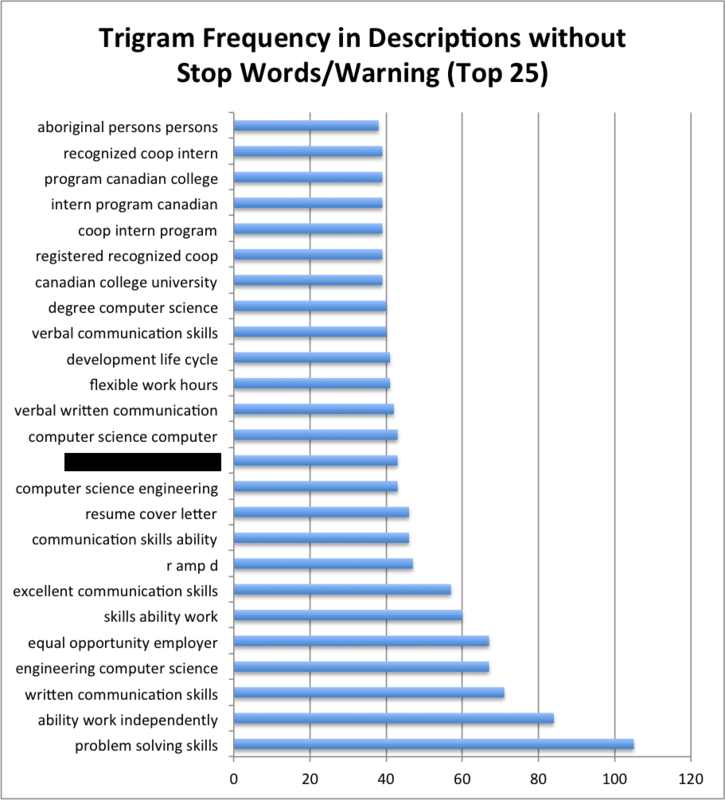 JobMine is the tool we use at the University of Waterloo for our co-op. For each job in JobMine there is a description of the job written by the employer. In this article I’ll dig into the job descriptions applying some of the techniques I talked about in the earlier articles. 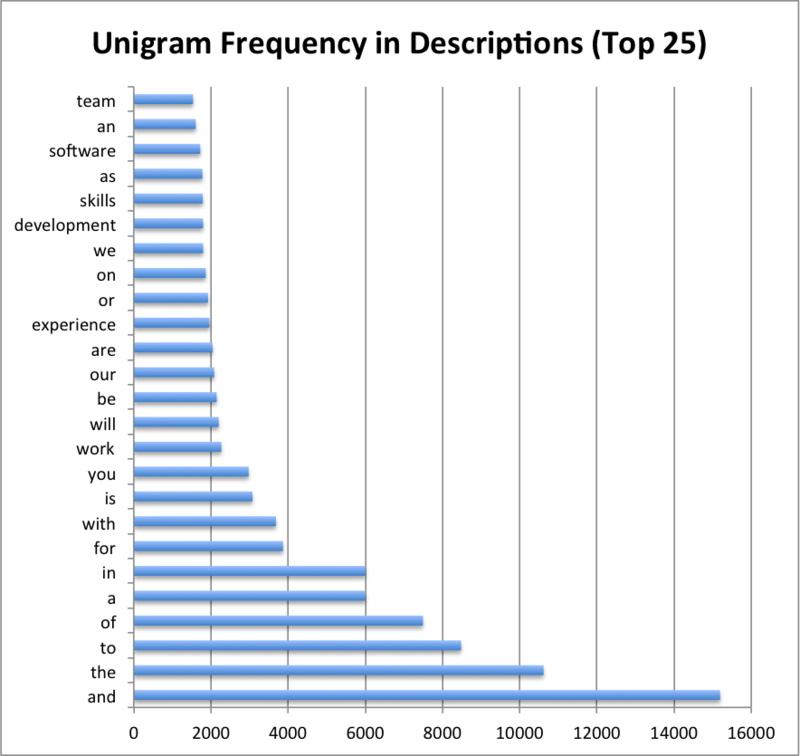 ##Unigrams## Just like I did in the first article, I tokenized descriptions and collected the most common ones. Ugh, that’s not very useful at all! The most common tokens seem to be those that are most common in English in general. Thankfully, we have lists of such common words. They’re called stop words. ##Stop Words## Stop words are common words that don’t really give any insight into the text, like ‘the’, ‘and’, ‘or’ or ‘but’. 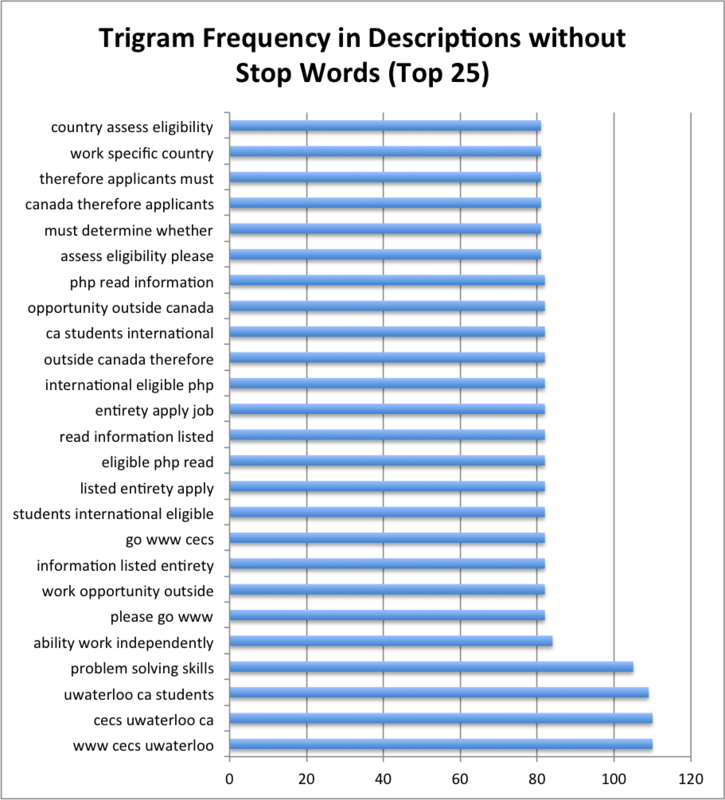 Often people trying to classify text or extract meaning remove stop words from the text. The idea is that removing the stop words reduces noise in the data and compacts feature space. I looked into the effectiveness of stop words in my Twitter Sentiment Extraction project. Now I need a list of stop words to remove. 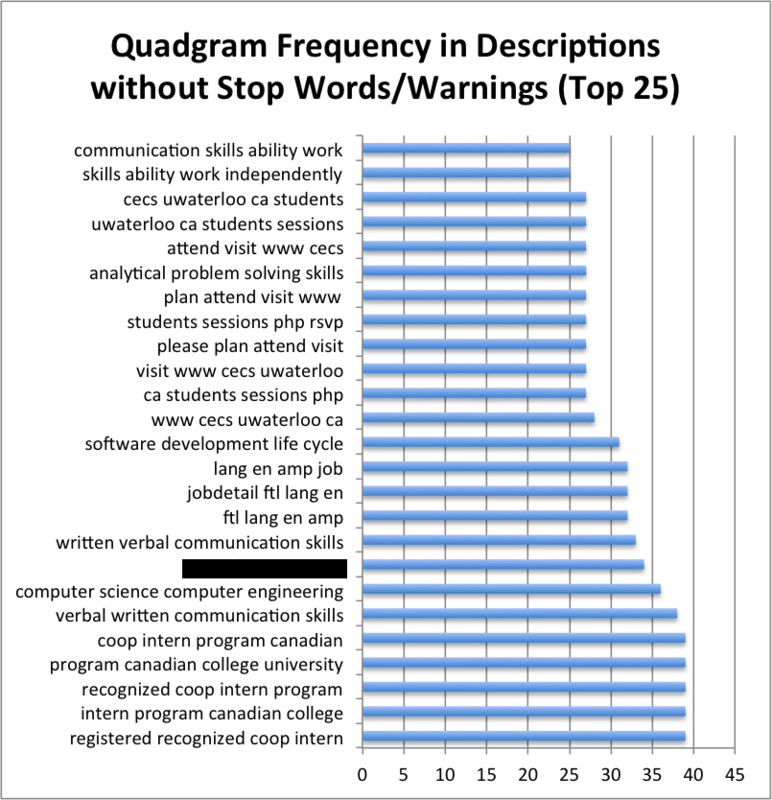 Since I’m a fan of the NLTK (Natural Language Toolkit) for python, I’m going to use the built in stop word list. ###NLTK Stop Words### I’ve reproduced the list here so you can get an idea of what will be removed. Again, please checkout the NLTK website for more information. 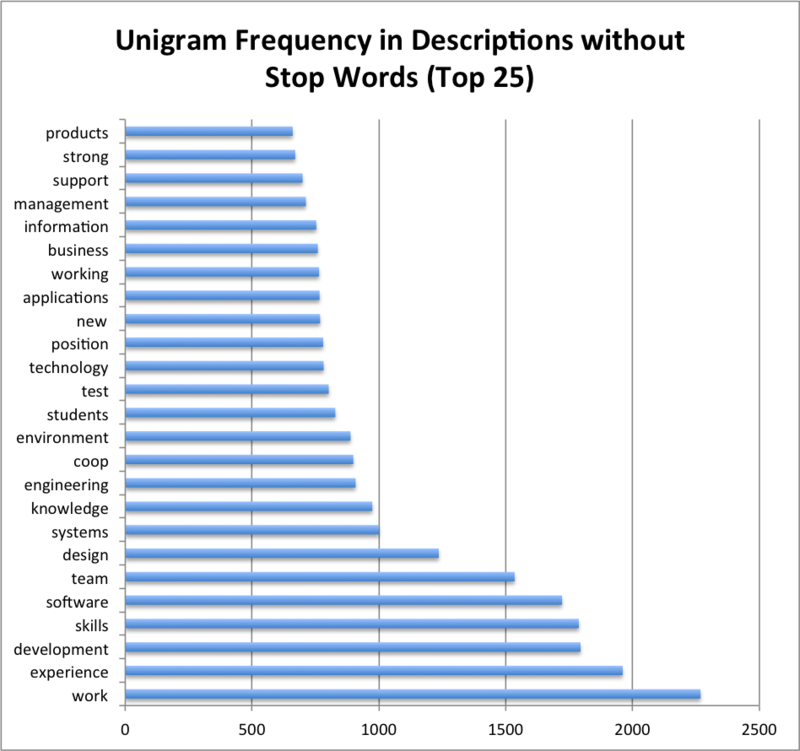 ##Unigrams - Stop Words Removed## So I removed all tokens that were in the stop word list inside my tokenizer function. Ah, now that’s better. Removing those stop words really seems to help. 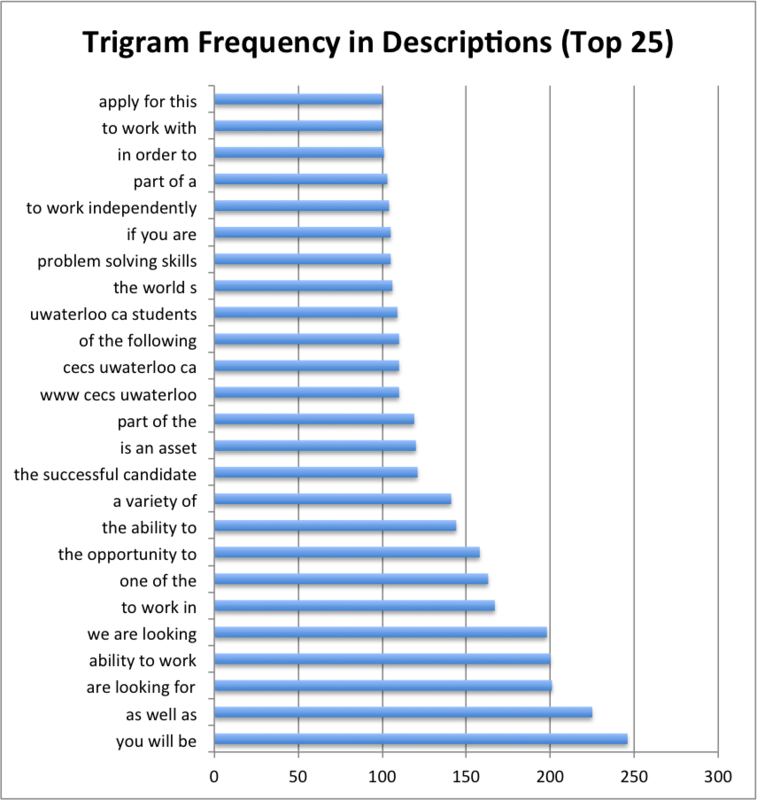 I did not expect for ‘work’ to be the most common token in the job descriptions. ‘Experience’ and ‘development’ were not surprises. 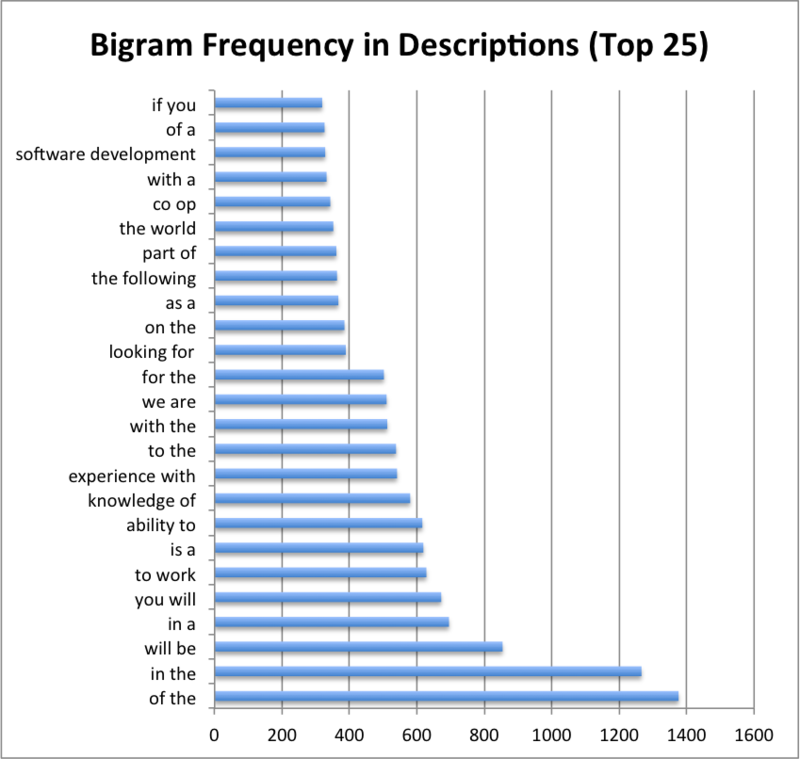 ##Bigrams## That covers what I talked about in the first article. Now I’m going to address the topics covered in the the second article, bigrams and trigrams. Hmm, same problem as before. 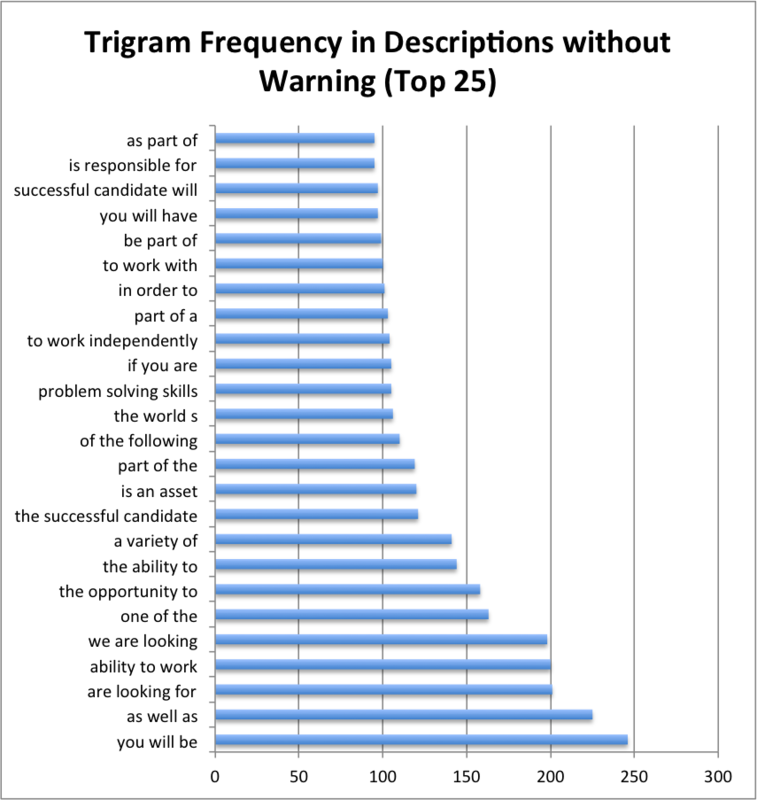 While some of the bigrams may be interesting (‘experience with’ or ‘knowledge of’), I think there’s some more interesting bigrams that are hidden in the noise. 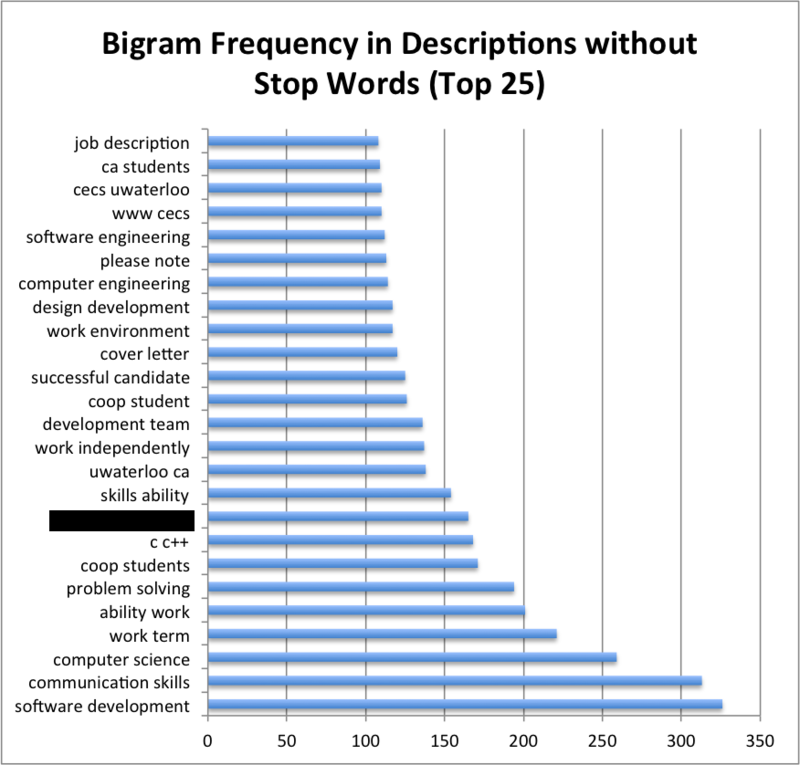 The bigrams that don’t contain stop words seem to be much more interesting. Seems like stop words are working. ##Trigrams## Previously, trigrams were not that interesting in the titles. I hypothesized that this was because the titles are so short, usually two to three words (I should run some stats on that…). Descriptions are often much longer so maybe they will be more interesting. There’s some weird stuff near the top of the range in the trigrams. The people who run JobMine (CECS) put a notice in the job descriptions of positions outside of Canada. It’s good to let people know about the possible issues with working internationally but it seems to mess with the data. 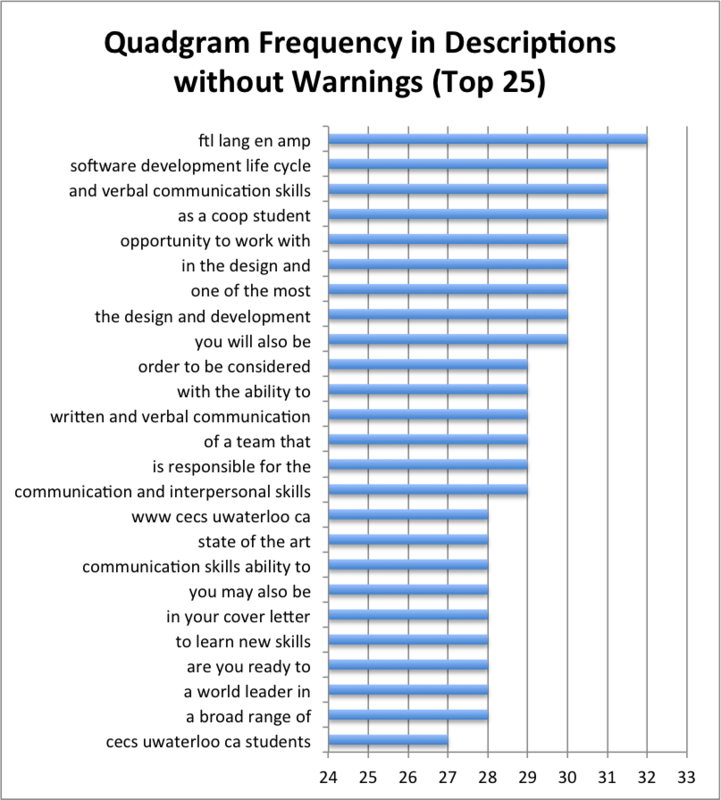 We are really interested in what employers write in the their job descriptions. So I’ll try to remove them. I’ve censored one of the trigrams as it would have given away one of the companies on JobMine and I don’t want to get in trouble with the university. In the future I’m going to try and play with public data sets so I don’t have this issue. ##Next Time## Looking at the descriptions seemed interesting to me but I’m definitely not done messing with this dataset yet. Some other things I’m thinking of doing next include lengths of job descriptions, writing level (though that could be sticky) and maybe some other stats that step away from the text itself. Hope you enjoyed this article, shoot me an email if you have something to say.